Enhancements in technology have changed how we live and learn. Working with learning resources across devices, whether smartphones, tablets, or laptop computers, empowers students to drive their own learning by putting increasingly intelligent technology into their hands. Whether the goal is to become an accountant, a businessperson, or simply an informed consumer of accounting information, Financial and Managerial Accounting has helped generations of students succeed. Its leadingedge accounting content, paired with state-of-the-art technology, supports student learning and elevates understanding of key accounting principles. 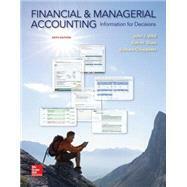 Financial and Managerial Accounting also delivers innovative technology to help student performance. Connect Accounting provides students with a media-rich eBook version of the textbook and offers instant grading and feedback for assignments that are completed online. Our system for completing exercise and problem material takes accounting content to the next level, delivering assessment material in a more intuitive, less restrictive format that adapts to the needs of today’s students.